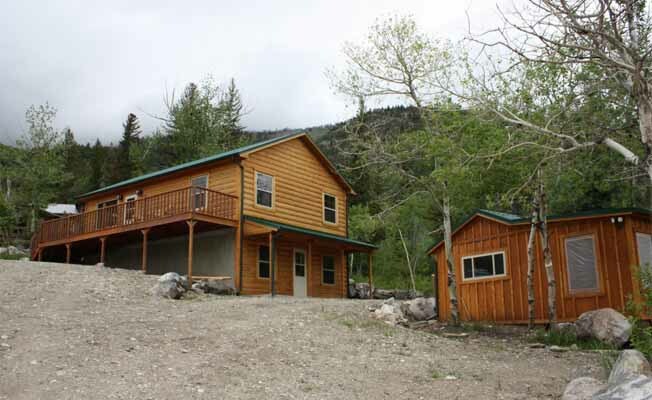 A brand new log home with a restored sleeping cabin in a stunning mountain setting. The cabins sit on eight private acres in the Boulder River Valley south of Big Timber. Blue ribbon flyfishing along a pristine stretch of the Main Boulder River. It's a mountain retreat but you also get wireless Internet and an iPod dock! You can rent the main house only for up to 8 guests or add the Cubby for 4 more guests. Add Honey's Cabin for groups up to 18! Brief Description The Mountainside Cabins sit on a piece of land that has been in the owner's family since 1916. It's a great retreat for anyone who wants to enjoy pure mountain air and some amazing fishing on the Main Boulder River just down the road. The main house is a brand new log home. A deck on one side affords superb views up the valley, and the sound of the creek out the back door will lull you to sleep at night. Bedrooms and baths The main cabin has 3 bedrooms and 2 full baths. On the main level of the main cabin there are two bedrooms, one with an extended queen size bed and the other with a double. They share a full bath with a tub and shower. On the lower level there is a bunkroom with a queen size bed and a bunk with a double at the bottom and twin on top. There is a second full bathroom with tub and shower on this level. The sleeping cabin (affectionately called The Cubby) is a few steps out the back door. It has two true bedrooms, one with two double beds and one with one double, sitting area and woodstove. A third sleeping area in The Cubby is a delightful sleeping porch with a day bed. Note: There is no plumbing in The Cubby. Kitchen This kitchen is well equipped for your crew with a dishwasher, microwave, food processor, coffee maker, blender and crock pot; you are all set for your stay. An extra bonus is a Keurig one-cup coffee maker (with a starter basket of supplies). There is also a large gas barbecue grill located on the back porch, just out the kitchen door. Dining area Just off the kitchen there's a dining table for four, a card table & plenty of TV tables for eating in the living room. There is also a table for 6 on the lower level and tables on both decks outside. Living room The cozy living room has a woodstove for chilly evenings, nice leather furnishings, a 42' flatscreen HDTV with satellite service and DVD player, as well as a CD player, iPod dock and a great book collection. All great for lounging after a day in the mountains. Family room A second living area downstairs in the main cabin has a second flatscreen TV and DVD player, a large collection movies and a foosball table for you to enjoy! In the bunk room there is a large table and a bookshelf with a good collection of games and puzzles. There's a laundry room with washer and dryer just off the family room. Setting, acreage, and views Tucked up in the Main Boulder River Valley, you have eight private acres to explore and the property borders National Forest land which gives you thousands more acres for exploring. Views are of mountain slopes and the beautiful upper Boulder Valley. A short walk brings you to access onto the Boulder River, a stretch with great fishing! It's also a great spot for children to play and to bring a picnic lunch. There is great hiking right out the door to Indian pictograph caves and to high peaks. You're a world away but there's so much to do! Outdoor Amenities A large front deck and a small back porch, a barbecue grill, hammock by the creek, a picnic table and plenty of other outdoor seating. Activities nearby This location is perfect for hiking, fishing, exploring and just plain relaxing. You are half way between two entrances to Yellowstone National Park (each about 95 miles away) making it possible to do a great loop trip; a beautiful drive the whole way!